Kids love bread, kids love avocados. Do the math! There’s no reason that little ones can’t take part in the latest overexposed food trend. Why: We use Sweet Potatoes or Yams, actually, we aren’t sure which, because the sweet flavor is familiar to toddlers and Sweet Potatoes pack more fiber as well as vitamins A and C as compared to their colorless counterpart, the traditional White Potato. They look awfully striking too. For more amazing facts about the nutritional powerhouse that is the Sweet Potato, definitely head right over to PositiveHealthWellness.com! 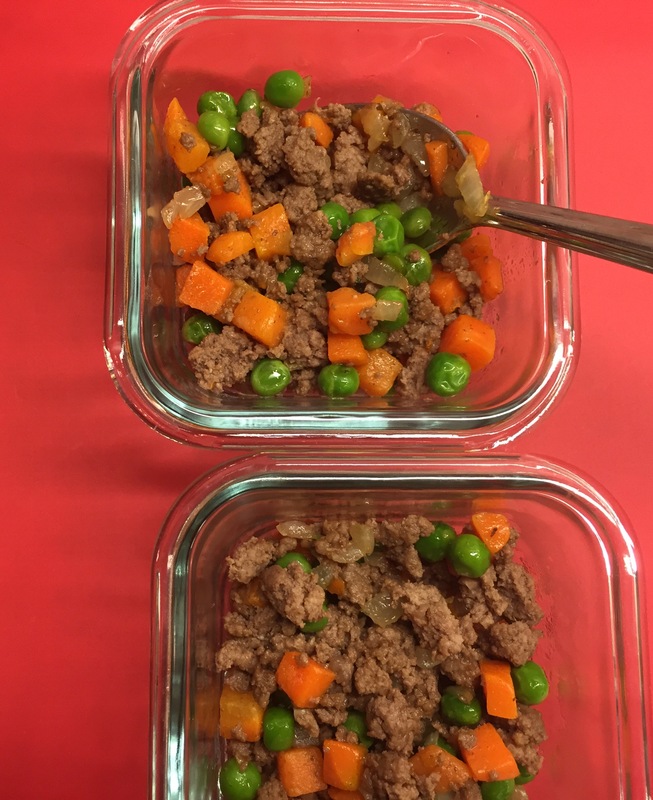 How: Using a frozen Pea and Carrot Blend and combining it with pre-cooked Ground Meat (I like to brown a big batch to last me a few days) alongside quickly microwaved Sweet Potatoes that are hand mashed, allows us to churn out several make-ahead servings in no time flat. You could be done in as little as 20 minutes. Wrap the pierced Sweet Potato in a wet paper towel and microwave on high for 6-7 minutes. Meanwhile…. Heat Butter in a medium sized skillet over medium-low heat and add the minced Onions. Allow to saute about three minutes, stirring occasionally, until they start to brown slightly. Add the frozen Peas and Carrots blend and stir together until thawed slightly tender (but not mushy), another two minutes or so. Stir in the cooked Ground Meat (or sub-in canned Beans for a vegetarian option). Allow to cook together another two to three minutes until warm throughout. Slice open the Sweet Potato and carefully scoop out the skin and place the flesh into a shallow bowl. Mash with a spoon or fork until very smooth. To serve, layer the Meat and Vegetable Mixture about 3/4 inch deep into an 8-ounce single-serving glass dish (or small ceramic bowl). Next, spoon some of the mashed Sweet Potato on top and spread carefully about a 1/2 inch thick using a spoon or even your clean fingers. Serve right away or store up to two days in the fridge! Serve warm. Why: Much of the angst we parents experience around toddler feeding comes from the ever-popular toddler food strike. When faced with such indomitable opposition, there’s only one place to turn – everyone’s favorite and unexpectedly healthy food, pizza. How: Using pre-packaged (ideally organic) flatbreads, we have a durable base (perfect for little hands to grab) from which to build our easy toaster oven pizza. Remember english muffin pizzas from your college dorm? Same idea. I like to mince in fresh greens like baby spinach or arugula for sprinkling to pack an extra nutritional punch. While I don’t love the idea of “hiding” extra veggies in food (why must they lurk in the shadows when kids should be learning to love them? ), adding them on top of a food kids (and adults) naturally love, is a great way to let your little one get better acquainted. So let your spinach fly free and watch as your tantrum thrower tastes this. Strained Organic Tomatoes, Jarred (Canned tomatoes are one of the most notorious sources of BPA). If you cannot be sure that your tomatoes are packed in BPA-free cans, buy them in glass jars or cardboard packages. We love Bionaturae Brand Bottles, and their cans are also BPA-free. Easy! Prep your flatbread as above. Spread with about a teaspoon or two of Strained Tomatoes. Add a few thin slices of Provolone (or Mozzarella) and pop in the toaster oven. As soon as the cheese has melted, remove and allow to cool to a reasonable temperature for you baby. Always check first! Serve and watch as they enjoy. Hands off that pizza, mom! When: Whenever you have pre-cooked grains or leftover pasta, and you can spare 10 minutes to brown the ground meat of your choice. *Note: if you choose rice as your grain, it’s a good idea to know were it is sourced from and review the latest information on arsenic. Overall, I try to limit my child’s rice intake as well as my own. Why: Lentils – an ancient legume popular in many cultures and on several continents- are a childhood staple for good reason. Packed with B vitamins, along with lots of dietary fiber and protein, they are great fuel for people big and small. We add pre-cooked quinoa, also a nutritional powerhouse, to this stick-to-your-ribs meal. Shortcut Lentil Stew keeps well in the fridge or freezer too. How: I’m going to let you in on one of my favorite hacks when cooking for kids – use your child’s favorite baby food to create an instant “sauce” to tie together your dish. This technique makes our lentil stew even quicker and adds additional nutrients to an already power-packed meal. And just in time for the chilly weather. Brown the Ground Meat in Olive Oil until fully cooked. Drain on a plate with paper towels. Wipe out the skillet. Return meat to the skillet and add the Lentils and Fresh Minced Spinach, optional minced Garlic or Garlic Granules.Turn heat to medium low and allow to warm, stirring occasionally for two minutes. Now add Baby Food Pouch and about 3 Tablespoons of Water – or more if you’d like a wetter consistency. Heat another minute or two and stir in Quinoa or other grain. Taste for seasoning and add a *tiny* sprinkle of Salt if you like. Allow to cool a bit and serve warm! What: Your kid’s frozen fish sticks without all the crap. When: Whenever you’ve got about 25 minutes to create an almost effortless fish dinner, without the heavy oils and frying. These fish “bites” can also be frozen up to three months. Freeze in layers on wax or parchment paper to prevent sticking. Why: Who doesn’t love an excuse to crack a bag of potato chips? 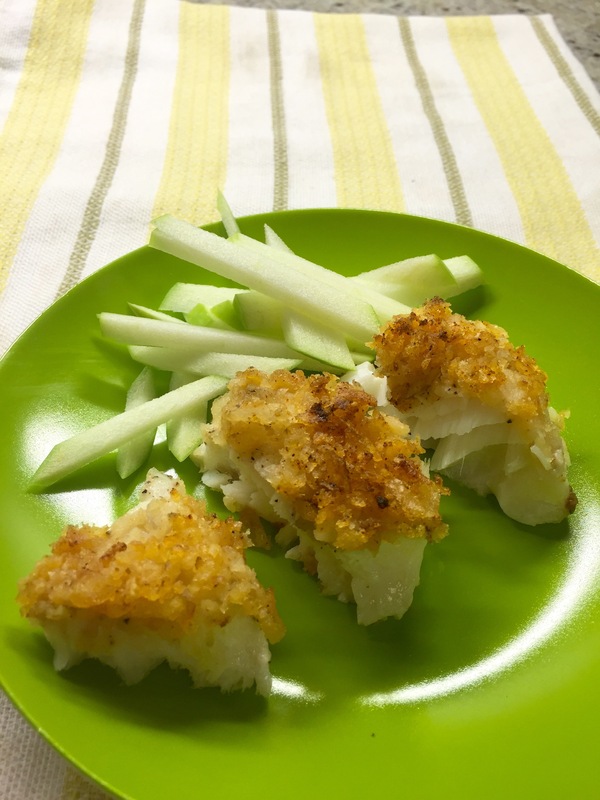 This incredibly easy recipe is adapted from a dinner recipe my husband and I absolutely love, so it’s actually perfect for the whole family – but when we’re making it for babies we don’t use cod. There are lower mercury options that are much more cost effective. How: Follow the simple toddler adaptation below and watch as your guppy gobbles up their yummy fish bites. Crush potato chips into fine crumbs by placing them in a plastic bag and smacking them with a blunt object. Sprinkle paprika into the potato chip crumbs and combine. Place fish fillets on a piece of parchment in a baking dish. Season fish fillets lightly with a pinch of salt and some pepper. Evenly spread 1 teaspoon or so of mayonnaise evenly over each fillet. Gently press Potato Chip Crumbs all over each fillet, covering the top of them completely. Bake for 10-12 minutes until somewhat firm and opaque. Turn on Broiler and finish the Fish for 1.5 minutes under the Broiler to brown the crust. Keep an eye on it so it doesn’t burn. Fish is done when it is easily flaked off with a fork. Allow to cool, and slice each fillet into bitesized portions. Snack time is everyone’s favorite. Today’s healthy bite is kid and adult friendly. Just be sure to leave some for your little one! 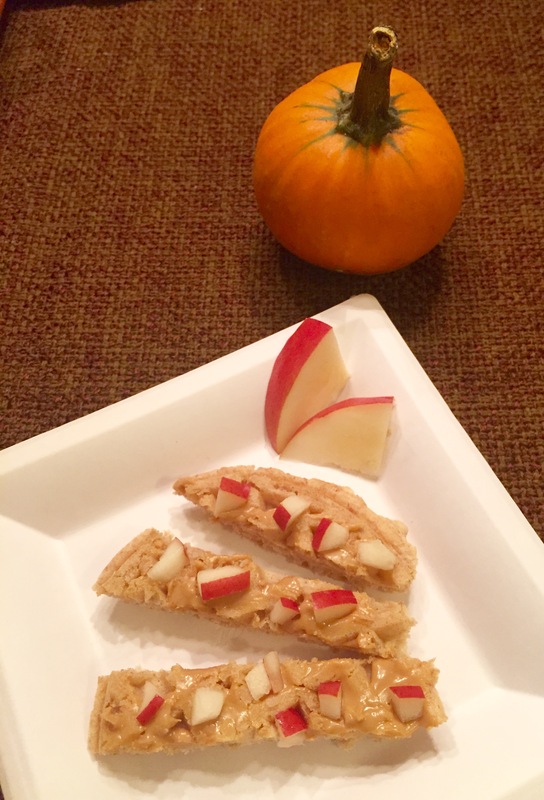 When: Snack time, breakfast time, anytime – it’s ready in minutes! Why: Kids love to be independent and these Waffle Fingers are easy for little hands to grab.They’ll love the taste too! Almond Butter is a healthy alternative nut butter. Be sure to check label to be sure it is made in a peanut free facility if peanut allergies are an issue. How: Frozen Whole Grain Waffles are great to have on hand. Spread the Almond Butter very thinly (it can be a choking hazard if too thick). It makes a great “glue” to stick your child’s favorite, seasonal minced fresh fruit. Pears are great right now, so that’s what we chose. Lightly toast the frozen waffle. Thinly spread almond butter and press in minced fruit. Slice into fingers and serve! 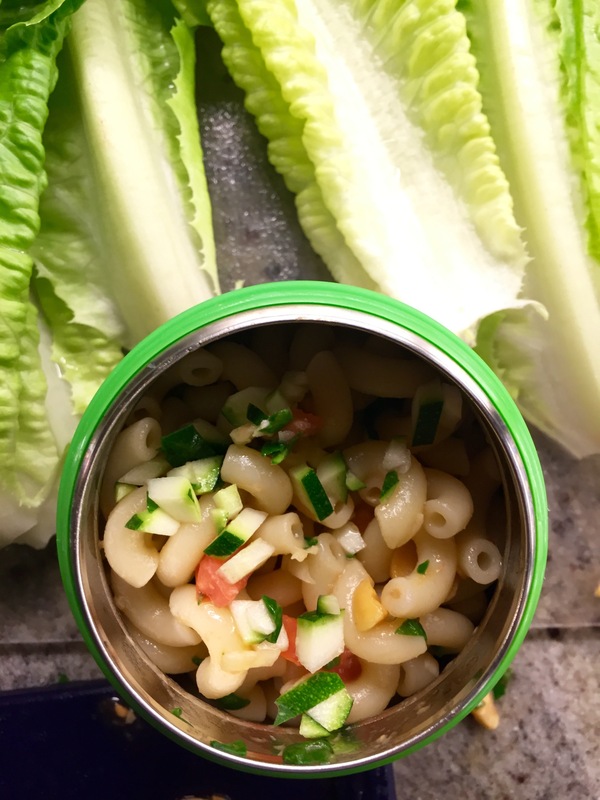 What: A simple method for customizable veggie pasta for your toddler. When: Whenever you’ve got spare vegetable ingredients, simply chop them small and store them in the fridge in handy little containers. You can add your favorite pantry or frozen veggie items when you’re ready to serve. Why: It’s a fact that the less you heat veggies, the more of their all-important nutrients are preserved. Assembling meals with pre-prepped raw and (healthily) canned components means you’re always just minutes away from creating a custom dish. Just add the pre-cooked pasta of your choice (choose kid-friendly shapes like orzo or macaroni). You’ll also never waste odd amounts of leftovers again! How: Our secret weapon – a little melted, salted butter poured over your pasta knits all the flavors together making it irresistible to kids. Combine all the above ingredients and stir in melted butter. Serve right away!